Are Your Internal Fluidics Crummy and Fouled? Hello! Zach Devier of SMT here with another blog, for your viewing pleasure. We’ve recently been spending quite a bit of time following up with all of the wonderful people that we met at the AACC Clinical Lab Expo we attended in July. One of the issues that continues to pop up is the bio-fouling of internal fluidic systems. In clinical chemistry, many of the analyzers used are known as “wet” systems. This means that the samples they analyze are liquid based, or have a liquid carrier which is typically some sort of serum. These systems can run thousands of tests a day! That’s a lot of stuff flowing through these machines. After a while, these fluidic systems can get pretty nasty! Our purpose and goal is to take care of all of that! Therefore, I wrote this blog to go over some of the advantages that chlorine dioxide presents over bleach when decontaminating these internal water systems. When compared to bleach, which is currently (we’re trying to change this!) 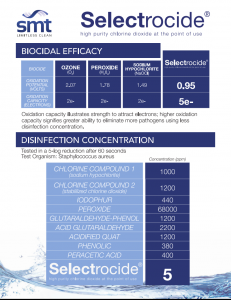 a popular chemical for analyzer decon, chlorine dioxide is head and shoulders above it in effectiveness. You certainly don’t have to take my word for it, though. The science behind this lies in the oxidation capacity. Check out the graphic below! As you can see, ClO₂ has a much higher oxidation capacity. Even further, it is effective at a meager 5 parts per million, while bleach requires 1,000 ppm. Chlorine dioxide is also a much more selective oxidizer than bleach. This means that ClO₂ is the superhero that can tell the difference between villains (pathogens) and civilians (Fluidic surfaces), and only beats up the villains. However, bleach is the regular hero that cannot tell the difference and beats up everyone. This means that bleach causes corrosion to the internal surfaces of the system. Chlorine dioxide, on the other hand, will only react with the pathogens inside the system. You can see the scientific reason behind this in the above graph. Oxidation potential, measured in volts, is the tendency of a molecule to oxidize. The higher the number, the less selective it is. Because ClO₂ is a gas molecule with no ionic charge, it is rinsed from systems very easily. This is because it is not attracted to anything inside of the machine. It typically only takes a single volumetric flush to rid the system of any trace of the compound, leaving no residual traces behind. When you compare that to bleach, which requires about 10 or more flushes, it saves a lot of time! Its gaseous, neutral state also makes it very effective against biofilms and algae. When pathogens stick to a surface, they begin to multiply in the presence of a food source. After a while, they start to build a protective barrier, similar to a military fort. When bleach is used to decontaminate, it simply breaks down the fort’s walls, leaving all of the soldiers (pathogens) behind to rebuild the wall. Chlorine dioxide, however, builds a Trojan horse, sneaks past the wall, and eliminates all of the soldiers inside. When those pathogens are killed, they detach themselves from the wall, along with their polysaccharide membrane! A third (boy it’s kind of nice that it’s a gas, huh?) advantage of its physical state is that it is able to decontaminate head spaces. As it flows through the internal system, a small amount of gas is able to escape the solution which then fills the volume of the system, including any head spaces and dead legs, leaving your machine completely decontaminated. To learn more about the advantages (there are a couple more!) of chlorine dioxide, contact me at zdevier@selectivemicro.com! Also, head over to our website clinicaldecon.com. NextWant to Make Your Store’s Produce Safer and Last Longer?